Navin Agarwal spearheaded the consolidation, debt reduction and capacity expansions plans of Vedanta group companies. He has more on his plate. About a decade ago, London-listed Vedanta Resources first tried to simplify its corporate structure. But barely two weeks after announcing what it called a mega-restructuring plan, the metals and mining giant had scrapped the proposal as the swap ratio fixed for the merger and demerger of businesses was not favourable for investors. Promoter Anil Agarwal didn't give up the consolidation plans and also continued with his aggressive acquisitions in the Indian market - in iron ore and oil & gas. Around this time, younger brother Navin Agarwal, who had played second fiddle for long, emerged from the shadows to do micro level management of the Indian businesses. When Vedanta completed the $8.67 billion acquisition of Cairn India in 2011, Navin was the first choice for becoming the chairman (he replaced Bill Gammell, founder of Cairn Energy). Later, in 2013, when Sesa Goa and Sterlite Industries merged to form Sesa Sterlite - renamed later as Vedanta Ltd, a subsidiary of Vedanta Resources - Anil handed over the top post to his brother. 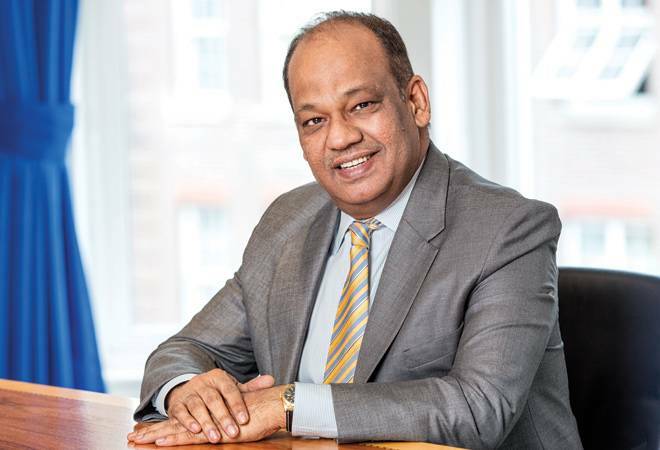 As chairman of both the entities, Navin pursued the consolidation plan and merged cash-rich Cairn with Vedanta Ltd in the beginning of this financial year despite the hiccups in the stock market. Cairn India shareholders were not too pleased with the merger and called it a raw deal for them. The merger was seen by some as giving Vedanta the access to Cairn India's massive cash reserve of `17,000 crore at a time when it was saddled with huge debt. Navin denied such intentions and said that the move will deliver economies of scale for the oil & gas company. A section of shareholders still feel that Cairn would have been in a better position as a standalone entity as it is now exposed to the volatility and the lesser margins of the metals business (except zinc). Meanwhile, Agarwal has spearheaded the cost optimisation and productivity enhancement programme at Vedanta Ltd (it operates in the zinc, lead, silver, aluminium, copper, iron ore, oil & gas and commercial power sectors). He also benefited from the recovery in the global commodity markets during 2016/17. Together, these factors translated into a strong consolidated EBITDA of `21,437 crore, up 41 per cent, and free cash flow of `13,312 crore, a 15 per cent rise, in the last financial year. In the past two years, Vedanta delivered total cost and marketing savings of about `4,500 crore. It reduced gross debt by over `4,000 crore in 2016/17 and is in the process of reducing it further by `6,200 crore in this financial year. Vedanta Ltd registered consolidated profits of `9,873.26 in 2016/17, after a loss of `17,862.62 crore in the previous year, on revenues of `71,721 crore, up 12 per cent. "We are a large cap private sector Nifty 50 company with a topline of about $12 billion and delivered shareholder returns of over 200 per cent in FY 17, which demonstrates our resilience to the cycle," says Navin. "We also contributed around $6 billion to the exchequer during the year, highest amongst large conglomerates. With debt-equity ratio of 0.6 and net gearing at 16 per cent, our balance sheet is probably the strongest in the country." Navin feels that the production growth from their assets gives them a clear edge over competition. "Challenge is to remain competitive, especially in the commodity downturn when one should keep focus on the basics and get them right," he explains. Even during the weak commodity cycle, Vedanta's output had buyers though prices were low. "Hence we remained focused on maximising volume, reducing cost and operating at global best efficiency," says Navin, detailing their strategy. Agarwal, who spearheaded the completion of organic projects and acquisitions, plays a key role in the strategic and governance framework of the group. He was the driving force behind ramp up of production across categories - zinc, aluminium, power and iron ore businesses - and it eventually strengthened revenue growth over the past two years. 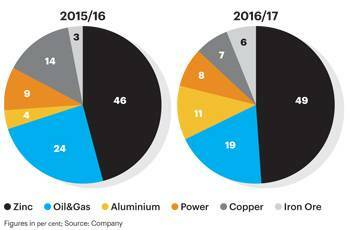 When the commodity cycle was sluggish between 2012 and 2016, Vedanta remained focused on the long-term strategic priorities. "The assets continued to deliver, but the management adopted a disciplined approach in capital allocation, prioritising high-return low-risk projects to maximise cash flows," says an executive. In the last financial year, Vedanta completed a $700 million capital expenditure programme against the original investment plan of $1 billion. Ramping up existing capacities will boost the cash flows with minimal incremental capex requirement, says the company. Subsidiary Hindustan Zinc's production capacity is expected to touch 1.2 million tonnes (MT) by 2020. For Aluminium, the production outlook in FY 2018 is around 1.5 MT. It has also ramped up iron ore and power production capacity. Going forward, the company expects a modest escalation in their capex programme, as it explore opportunities to expand the zinc and oil & gas businesses. The company's focus will continue to remain on maintaining strong credit metrics and using free cash flows to drive further reduction in gross debt. Former CEO Tom Albanese had said in the last annual report : "We will only invest in high return projects in our existing businesses." He had added that the best days are ahead for the company as the commodity markets had gradually started improving from 2017. Agarwal says that the group hopes to be a major contributor to India's oil requirement and the 'Make in India' thrust - it aims to ensure import substitution of major commodities. "Towards this, we plan to invest $7-8 billion over next few years to increase domestic crude oil production, be the world leader in zinc and successfully run biggest roof top aluminium smelter besides doubling the copper business in India." With these initiatives, the company has the potential to double its top line and bottom line in the foreseeable future, Agarwal sums up.